This is hands down my favourite picture book at the moment. In the last few weeks I have read it to large groups of students from Year 2 to Year 6 and even the older kids can't help but laugh out loud...it may have something to do with the bums in the book! I also love this photo (modest), I took it for my Instagram account but had to use it here, and I think I will use my own photos from now on. Who doesn't love a random pineapple in book photos. 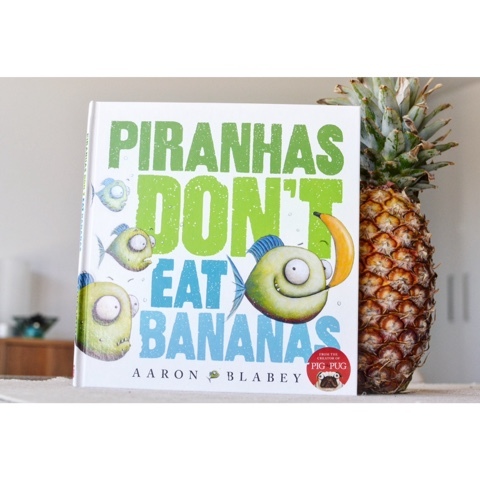 But I am sure piranha's don't eat pineapples either...it's just that pineapple doesn't rhyme with piranha. Thanks. I am enjoying my Bookstagram account. I like photography, but don't do enough, as I am usually too busy reading....this way I get to do a bit of both!